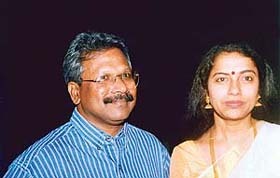 In 1988 Ratnam married Suhasini, the niece of Kamal Haasan and daughter of Charuhasan. Suhasini is a National Award-winning actress and a well-known filmmaker as well. They have a son named Nandhan Maniratnam.Charuhasan, his father-in-law,is a National Award-winning actor. Ratnam lives in Alwarpet, Chennai, where he runs Madras Talkies, his production company.